Smart-UPS X is an intelligent, long run time UPS for IT and telecom professionals who need their critical servers and communication systems to ride through power outages that could last hours. More efficient than on-line UPS's and easier to deploy than generators, the Smart-UPS X has the ability to accept external batteries at any time to increase availability and because it is a Smart-UPS, you know it is reliable.APC by Schneider Electric's Smart-UPS is the most popular uninterruptible power supply (UPS) in the world for servers and other network devices such as switches, routers workstations and point-of-sale devices. Available in either traditional tower, rack optimized, or extended run convertible form factor (750va-3000va). The world's most popular network and server UPS.Trusted by millions to protect critical data and equipment from power problems its proven line interactive design supplies clean and reliable network-grade power over a wide range of utility conditions. Conditions include surges, spikes, brownouts, blackouts and other transient conditions that can cause costly downtime, data loss or hardware damage.Smart-UPS are known for their intelligence, monitoring and control capability. Users can actively manage power to their critical devices using an intuitive and interactive display, through the supplied PowerChute Business edition software or remotely with optional network management cards that plug directly into the unit's Smart-slot interface.Patent pending "green" mode provides optimum reliability and efficiency of > 97% which saves utility and cooling costs without compromising availability.Advanced battery management provides Temperature compensated charging which extends life and advanced algorithms proactively recommend battery replacement date. In addition, Switched Outlet Groups can allow users to Reboot Hung devices, shed non-critical loads to conserve runtime, and set sequenced startup/turn off. Protect your server, switches, routers, and networking devices with the APC Smart-UPS SMX1500RM2U. This UPS provides backup battery power in the event of a power outage monitoring and safeguarding your equipment from harmful power conditions, spikes and surges. An automatic green mode ensures you are operating at the highest level of efficiency while smart battery management maximizes performance. Use the intuitive LCD interface and PowerChute software to configure settings and monitor usage. This Smart-UPS has a 1,200-watt power capacity, eight battery and surge protected outlets, three switchable outlet groups and the capability to add external battery packs to extend the runtime needed for network applications. This model converts between tower and rack-mount for convenient installation depending on your needs. 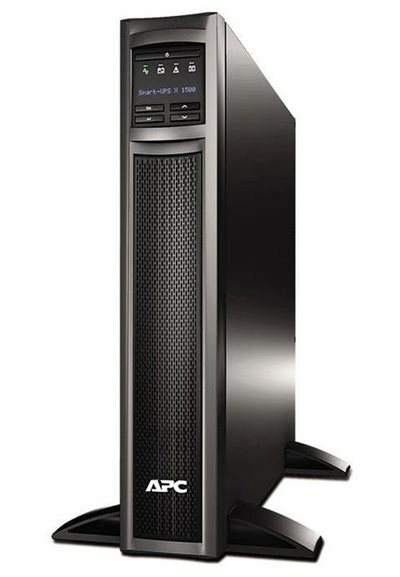 Keep your electronic equipment protected through blackouts, brownouts, and other power disturbances with APC Smart-UPS. The generous runtime while on battery with the option to extend the runtime with external battery packs lets you continue working during medium to extended-length power outages. If you need to add extra runtime during an outage, attach plug-and-play external batteries for clean, uninterrupted power. Providing a greater level of control this UPS has one switchable outlet group that allows individual control separate from the UPS. Allowing the ability to reboot hung devices, program sequenced on and off and non-critical load shedding of equipment. Automatic voltage regulation (AVR) adjusts high and low voltages to a safe level, ensuring your equipment has reliable power and preserving the life of the battery. The pure sine wave output while on battery provides the highest degree of compatibility for active PFC (power factor corrected) servers and sensitive electronics. For added safety, this UPS can be attached to an Emergency Power Off (EPO) system for a safe shutdown in an emergency situation. Operate efficiently with the Smart-UPS green mode, conserving energy when power quality is within optimal levels and power conditioning is not necessary. The UPS will enter and exit green mode automatically, ensuring you are always operating at the highest efficiency while saving power, reducing utility costs, and generating less heat. To help you monitor your energy usage, this UPS has an energy meter that provides actual kilowatt-hours of usage. For easy battery maintenance, this UPS provides you with a predictive date for when battery replacement is recommended. The periodic self-test and disconnected battery notification both ensure you detect any faulty batteries. To prolong battery life, the Smart-UPS regulates the charge voltage according to battery temperature. Check utility status and adjust settings on the easy-to-use LCD interface. A bright display provides clear, accurate information in multiple language options, and intuitive navigation keys make it simple to configure settings. A SmartSlot lets you use a network management card to customize UPS capabilities. Designed for exceptional usability, PowerChute Business Edition software provides safe system shutdown in the event of an extended power outage while preventing potential data corruption. It's fast and easy to install, and you can tailor settings to meet your individual needs. Find cost savings by using PowerChute to monitor your equipment's energy consumption. This Smart-UPS is covered by a three-year limited warranty. This product also comes with a lifetime equipment protection policy of up to $150,000. APC will repair or replace office equipment that sustains surge-related damage while properly connected to a registered APC Smart-UPS unit. APC Smart-UPS SMX1500RM2U, CD with PowerChute Business Edition software, documentation CD, rack-mount support rails and hardware, removable support feet, Smart-UPS signaling RS-232 cable, and USB cable.